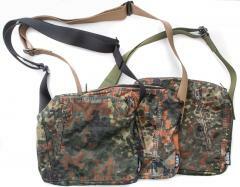 A cute small shoulder bag made out of BW Flecktarn parka. Almost too cute for a man not to use. Only almost. The story behind this is our designers looking at nonsellable BW parkas and figuring out what could be made out of them. 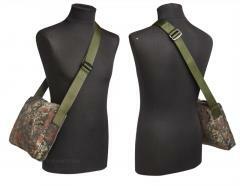 Look closely, and you see the BW parka hem pocket on front - one jacket is perfect for making two of these bags. 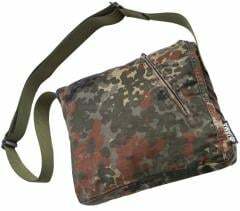 The bag is made out of very thick and durable parka jacket material (usually 80/20% cotton/polyester) with Flecktarn camouflage pattern on it. 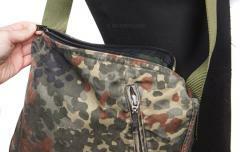 One zippered pocket on the front, access to rest of the bag from a zipper on top of the thing. The shoulder straps are made out of two second quality Särmä BDU belts, so first of all the shoulder strap can take a weight, and secondly there's pleeeenty of adjustment. The straps come in three colours, and we don't pick. The bag is made out of jackets that have been impregnated with water repellent at some point. Depending on the bag, there might be a lot or not very much of this effect left. Measurements about 36 x 30 cm.